This document was drawn up in May 1880, when French workers' leader Jules Guesde came to visit Marx in London. 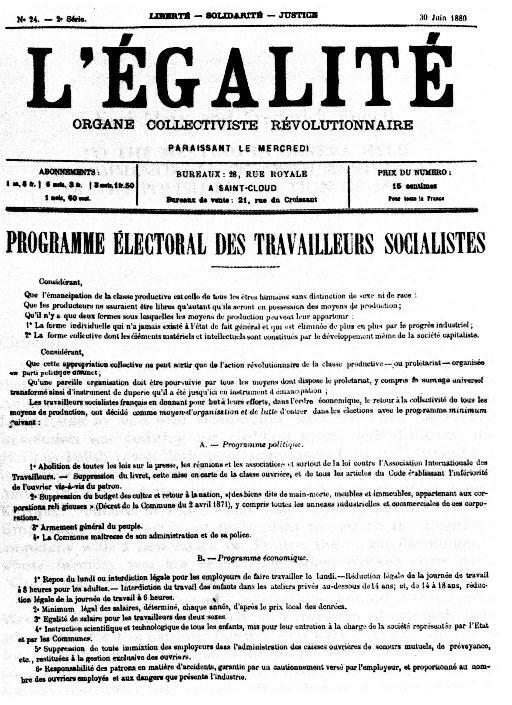 The Preamble was dictated by Marx himself, while the other two parts of minimum political and economic demands were formulated by Marx and Guesde, with assistance from Engels and Paul Lafargue, who with Guesde was to become a leading figure in the Marxist wing of French socialism. The programme was adopted, with certain amendments, by the founding congress of the Parti Ouvrier (PO) at Le Havre in November 1880. The introductory, maximum section of the PO programme appears in the Penguin collection of Marx's political writings, The First International and After, in a translation from the German text in the Marx-Engels Werke. So far as we know the rest of the programme has not been published in English before. The translation which appears here is from the original French version in Jules Guesde, Textes Choisis, 1867-1882, Editions sociales, 1959, pp.117-9. We are grateful to Bernie Moss for providing a copy of the text. The Commune to be master of its administration and its police. Abolition of all indirect taxes and transformation of all direct taxes into a progressive tax on incomes over 3,000 francs. Suppression of all inheritance on a collateral line  and of all direct inheritance over 20,000 francs. 1. Marx and Engels, Selected Correspondence, 1975, p.312. 3. Engels, 'A Critique of the Draft Social-Democratic Programme of 1891", in Marx and Engels, Selected Works, 1983, Vol.3, p.438. 4. Bernard H. Moss, The Origins of the French Labour Movement, 1830-1914, 1976, p.107. 5. Ibid., p.11. Marx's famous remark, quoted by Engels in a letter to Eduard Bernstein, can be found in Marx and Engels, Werke, Vol. 35. p.388. 6. The 'livret' was a certificate which a worker was legally obliged to present when taking up a new job, confirming that his debts and obligations to his previous employer had been discharged. The practice was finally abolished in 1890. 7. The Code Napoleon, the French law. 8. i.e. not by direct descendants. NB: Our thanks to Graham Taylor for pointing out that the words “(land, factories, ships, banks, credit)” which were added here in the text supplied, but were not included in Marx's original wording, and have been deleted, as according to the text printed in L’Égalité. NB2: The text from here is not authored exclusively by Marx, though he worked on it with Guesde.